Everyone takes a different approach to bicycling and different motivations for doing it. For many it is recreation; riding trails or just riding around with friends, perhaps BMX or other forms of stunt riding. For others it is transportation; a way to get around town in addition to a car or because you don’t have another option. Many, like myself, prefer cycling because it is a healthier option, not just for our bodies but for the planet as well. For some of us these motivations and approaches to cycling change over time. For me it is a combination of things. My approach to cycling is that I am a knight and my bicycle is my horse. My helmet and boots are my armor, and if needed my U-Lock is a sword. I serve no lord, save myself, a free and sovereign knight riding the lands and helping the people where I am needed. In my travels I’ve helped stranded motorists push their cars to safety, given legal help to people being unjustly harassed by police, been an emergency bike mechanic, and generally provide a sense of levity with my plethora of bike lights. This is much the same approach I take to cycling and my life at Burning Man. My motivations are recreational, health, environmental, and above all the need to be mobile. After years on public transit it is wonderful being able to set my own schedule with a bike. After years of being trapped behind the wheel of a car it is amazing being out in the world to smell the flowers and feel the breeze caress my sun-warmed skin. For these reasons you can see why I’d be a little miffed (understatement) by an article in November 9th’s New York Times which states in plain English, with supporting evidence, that it is OK to kill cyclists. Truly, people get more upset by the killing of dogs. I love animals as much as the next person, especially dogs, but I also feel that human life is generally of a higher value than dog life (dog’s don’t compose Mozart). Maybe you feel I am using too much hyperbole and rhetoric, but the statistics bear this to be true. To quote Leah Shahum, the executive director of the San Francisco Bicycle Coalition, “we do not know of a single case of a cyclist fatality in which the driver was prosecuted, except for D.U.I. or hit-and-run.” Josh Alper, the cyclist who was killed in Santa Cruz mentioned in the NY Times article, was a friend of my friends, a man who I probably crossed paths with during my decade living in Santa Cruz. I imagine if you ask around you know someone who has lost a friend or family member in a cycling accident; I know several. Cyclists are not flawless, we are guilty of breaking laws just like drivers. I am no exception but I make the effort to be on my best behavior at all times; you only have one life and after so many close calls you begin to change your risk equation. The major difference between bikes breaking the law and cars, as I see it, is the ability of the vehicle in question to inflict terminal damage to another entity. Let’s take the example of running a red light, under California law bikes and cars are treated the same (even though section 21453 does not mention bicycles at all). Considering that of all the studies done on bike fatalities cars were found to be at fault over half the time in all but one, one study found cars to be at fault 84% of the time. Despite that fact, police are still quick to blame cyclists for their deaths, even without any evidence. What can we as cyclists do to defend ourselves? Practice situational awareness, not just as a cyclist but in life in general; it will save your life sometime. Wear a helmet and adorn your bike with lights, gloves are also a great idea (I almost always wear a pair after a nasty off-road fall earlier this year). In regards to lights it is important to have side visibility as well as front/back lights. The bikeglow light I linked to is a perfect way to light every angle of your bike with one light, it also makes you a 24/7 bike party. You can also educate yourself about when and where cyclists are most likely to be killed in your city (in my city of SF I hear that is where Octavia/Fell meet Market St). Similarly, it is good to know where the dedicated bike routes are across your city. We can also lobby our local, state, and federal politicians to get more cities to be like New York and recognize that a fatal collision is not an accident, it is the result of someone’s gross incompetence and its product is one person prematurely dead. The US still has a long way to go to be the Netherlands, who redesign unsafe roads after a crash happens and place the burden of proof on cars in a crash. 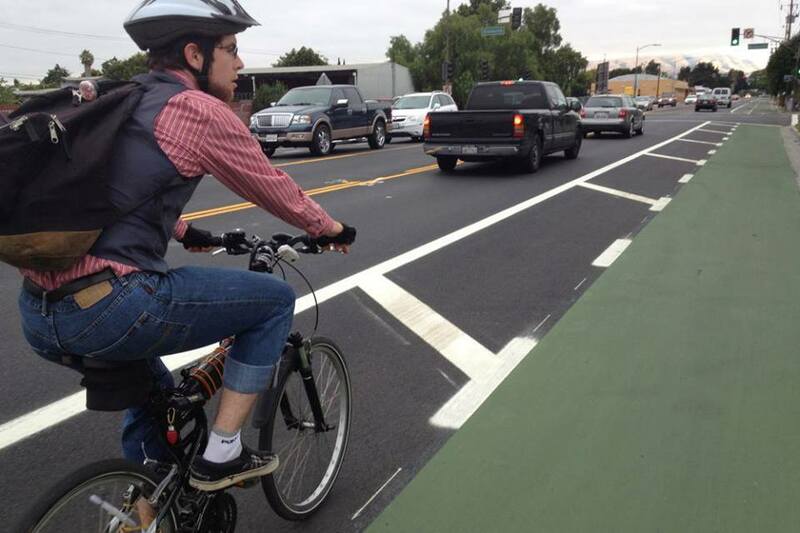 But if the abundance of new green paint on city streets around the Bay Area is a hint, biking is more than a fad, it is a growing trend that is here to stay. If you are one of those drivers, like the countless who have passed me and cussed me out while attempting to run me off the road for fun, you are part of a dying breed, you are a dinosaur. You will be extinct sooner than us bicyclists and we will inherit your roads. Now piss off and stay out of my bike lane. If you are one of those drivers or cyclists who obeys the law, kudos to you for being one of the few out there. Photo courtesy of Lady Fleur (who also has an amazing bike blog). Remember, while I may be a bicycle knight, my armor is only plastic and cotton. As a driver you sit behind the controls of a 4,000 pound death-sledge which hurtles down city streets at 40 miles and hour, which is roughly 160,000 pounds of force (F =ma), if I have the math right (I’m a political science major, not a physicist, we don’t learn real math or science). That is enough force to smash through walls, or flatten a cyclist or pedestrian. Remember that the next time you text while driving (only 6 times worse than driving drunk). [EDIT]: A friend linked me to this rebuttal piece to the NY Times article I discuss above. It is pretty preachy and radical at times, but he makes a lot of good points and I am inclined to agree with him as much as the NY Times writer, perhaps more. Thanks for that link, Ed, very informative. I can’t believe the accident vs. collision distinction has been discussed for so long without any substantive changes taking place. Even still, this is all centered on cars, considering jury’s and politician’s sympathies towards drivers I imagine bikes being hit will still be viewed as accidental.